Scratch-like rash may indicate a type of inflammation of the skin. Rashes are altered skin color with changes in texture. The cause of skin inflammation includes things like pityriasis rosea, lichen planus, dermatitis, eczema, and many other conditions. You may know what caused your rash and know what to do, but if you don't know why you have a rash that appears to be scratches it will help to understand some of the more common causes. Hives can form into a scratch-looking rash as a result of an allergic reaction to something. These appear as raised bumps, redness, itching, and even heat to the touch. The most common causes are eating something you are allergic to or skin exposure to an allergen. When you are exposed, you release histamines to try and fight off the offending substance. The scratch marks may even appear due to itching with your fingernails. The appearance of hives may precede a worse reaction known as anaphylactic shock, so if you have hives the first time, seek medical attention. If you have hives for the first time and develop a swollen face or have trouble breathing, seek immediate medical help. If you have mild hives, they may go away without treatment as the offending allergen leaves your body. You can try a cold wet washcloth over the rash to help with itching and redness. Or you can use an allergy cream or oral over-the-counter antihistamine for immediate relief and stop the reaction. If you get hives often, you may need to be referred to an allergist for allergy testing and further medical treatment. You can also try an elimination diet and stop using certain laundry or beauty products. Scabies are actually caused by a mite. It is a contagious infection by a very tiny bug that is not visible to the human eye. They burrow into the skin and feed on the skin cells, which may cause a rash that looks like scratches. This rash is very itchy. They can be spread by skin-to-skin contact, beds, clothing, and used bath towels. They live on surfaces for up to 3 days. Scabies affects anyone of any age and is found just about anywhere that people live if an area is infested. They are most commonly found in cabins, nursing homes, group homes, and shelters for homeless. Symptoms usually appear within the first 4 days of exposure if previously infected, but a first infection could take up to 6 weeks to show symptoms. A doctor or dermatologist will have to prescribe a lotion that is applied to the skin. The body has to be treated from the neck to the feet. Some people may need treatment to the head and face. The lotion is applied at bedtime and washed off in the morning. The process is repeated every week until the rash is cleared. Some people will scratch at their skin and cause a skin infection. Antibiotics may need to be given if a bacterial infection develops. The doctor may also prescribe steroids to decrease inflammation and itching during treatment. Cholinergic urticaria is a type of hives that occurs in response to heat and sweat on the skin. You may have heard this called "heat rash." It can appear as raised bumps that form into lines and circles on the skin. When the core body temperature goes up enough to make you sweat, the rash begins to appear. People who suffer from cholinergic urticaria feel it when they take too hot showers, run fever, undergo periods of stress, do strenuous exercise, and even eat foods that are hot. This rash can set in quite quickly after you start to sweat and last for up to an hour and a half. Besides a rash that looks like scratches and bumps, symptoms also include red inflammation of the skin, burning sensation, the feeling of heat, headaches, dizziness, stomach cramps, and even shortness of breath. 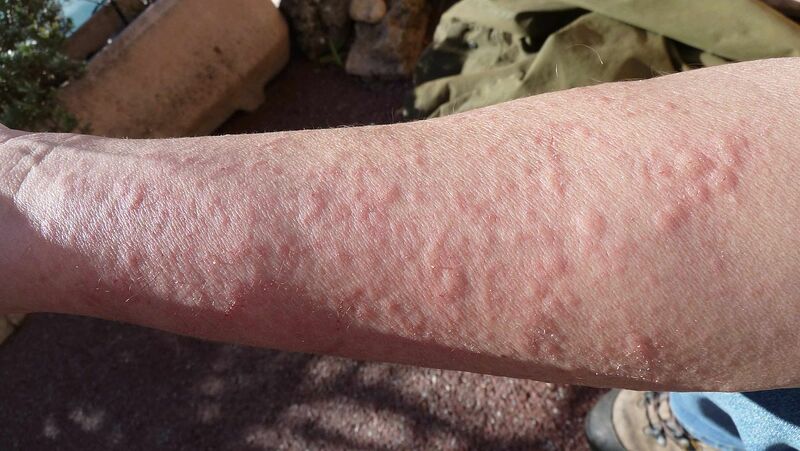 This is a type of allergic reaction to heat and sweat so some people may go into complete anaphylaxis. If this happens, try to have someone exercise with you and call 9-1-1 if you have trouble breathing. If the reaction is mild, you can try an oral antihistamine and cool your body. Some people benefit from taking antihistamines prior to exercise. Some people even benefit from using blood pressure medications that calm the central nervous system. Shingles is caused by the varicella zoster virus, the same virus that causes chicken pox. It causes a rash that appears in a line or band usually on the nerve plane of the abdomen. It spreads to the face or other parts of the body. It is common in those with compromised immunity and older people. While you only get chicken pox once in a lifetime, shingles can occur multiple times if your immune system isn't strong. Other symptoms include headache, dizzy spells, severe pain, itching, and flu like symptoms. There is now a vaccination for shingles to help prevent the disease. Since shingles is a virus, the only medication is antiviral medication. The doctor can also prescribe medication for pain and itching. It is important to drink lots of fluids and keep the blisters clean and dry. Try to avoid people that have never had chickenpox, especially pregnant women and the elderly. Shingles is only contagious to those who have never had chickenpox. Body aches, pain near the rash, feeling "flu-like"